You are here: Home / Our Animals / Chickens / Confessions from the Coop: Who’s Laying?? Confessions from the Coop: Who’s Laying?? 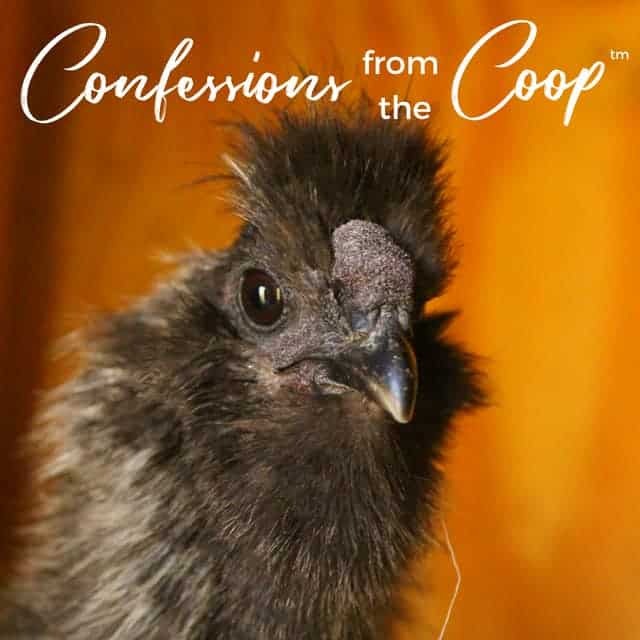 In this Confessions from the Coop series, I share a “behind the scenes” glimpse of life on the farm! Enjoy! I’ve decided I’m building the ducklings a new fenced in area – they’re already too small for their tractor (the dang chicks stayed in there for a month! Sniff….they grow up so fast!) and it’s warm enough that they’ll be fine in a super-secure fenced in duck house. So, they’ll get their own palace, complete with a pool, a deep waterer for cleaning, a treat bin for black soldier fly larvae and Fluffiest Feathers Ever (yep, it’s full of Vitamin B, so the ducklings have been getting it too – I think that’s why they’ve grown so quickly). As of right now, I’m not going to put flooring on the run besides dirt, but I’m considering brick or other stone so it’s easy to clean and won’t STINK in the rain. You know how easily their poo can turn into a cesspool! The mornings have been getting cooler – I sure hope they have their feathers by October!! One of my bantams started laying….and I have no idea who. Based on ages, I’m pretty sure it’s Partridge – a tiny bantam rescue hen someone gave me. But I can’t be 100% certain because I’ve never seen her lay. Previously, she was in a quarantine coop with roosters, and never laid anything. But now she’s in the coop with my Silkies and bantam Cochin hens, and eggs are appearing. The Silkies and Cochins are they’re just a few months old. They’re right on the cusp of laying age, but at just 5 months, it’s a tad too soon for them. 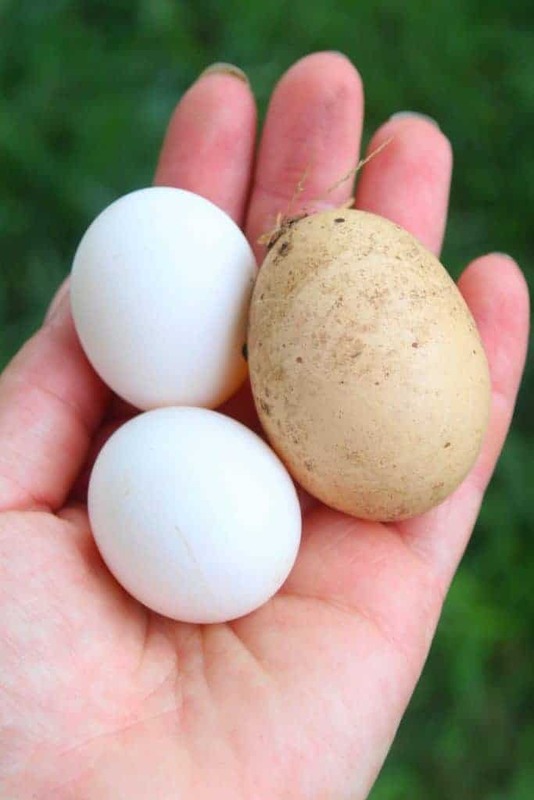 The eggs are pure white and about 1/2 the size of a regular egg. I haven’t cracked one open yet to check whether they’re fertile, but if they are….people, I’m hatching bantam eggs. Because the only rooster she’s with is also a bantam. And the chicks will be ADORABLE. I’ve put calendula in the nesting boxes and they’ve been getting Fluffiest Feathers Ever! and Best Eggs Ever! with their feed – which might be why Partridge started laying. We’ve been giving the hens Fluffiest Feathers Ever! lately because the roosters got a bit aggressive earlier this year – and the hens are growing beautiful, glossy feathers back. Some are taking longer than others, but that’s kind of the nature of growing feathers. Some hens just their sweet time! My Blue Copper Marans especially has regrown her feathers quickly. In the span of just a few weeks – less than 4 I think – she’s completely covered where the roosters pulled out all her feathers. She’ll be 4 years old I believe this fall (she was born in November – that much I do recall). The years do pass by, don’t they? We’ve also given Fluffiest Feathers Ever! to the chicks once they reach 5 weeks to help them grow healthy feathers. One of the recent hatches has a completely grey chick. 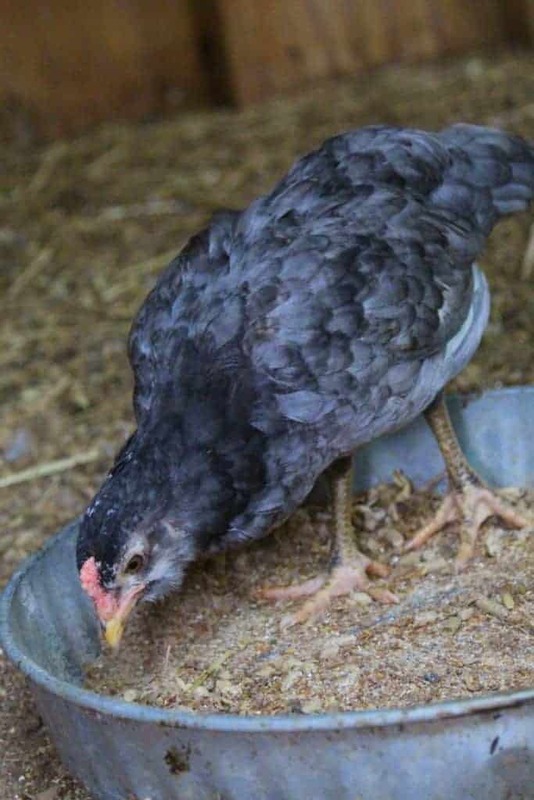 I know this is Hawk’s daughter (I’m sure its female) because the chick has brown tips on the end of her feathers and I KNOW she’s not from my Blue Copper Marans hen (the only other grey hen on the farm) because I didn’t incubate Blue’s eggs. She never lays any, LOL! I learned the other day that in Ancient Egypt, there were no chickens (who can imagine such a world?) but there were ducks and quail, and they kept them for eggs and meat. That’s why there’s hieroglyphs of ducks and quail, but not chickens. I thought that was pretty interesting. I hope you’ve enjoyed these photos – I’ll see you next week!